Your furry friend is one of your top considerations around the home. When planning your home layout and design, you ought to consider your pets’ safety and protection. On this note, you ought to invest in high-quality kennels where you can keep your dogs. Many people will prefer having them inside the house where they can be monitored closely. But, your little pet needs some self-time away from kids and other pets. For this reason, you should explore kennel options to give your pup some more freedom outside be it to hide or rest. On the plus, you’ll also spend less time cleaning up your pet’s litter around the house if you keep him in an outdoor kennel. Most kennels available on the market are suitable for a wide range of use. That is, on the patio, in the backyard, inside the house or even in an RV. If your dogs are not too big to be put in a physical fence and you’re worried if left alone in the backyard they might start chasing squirrels or whatnot the PetSafe Cottageview Boxed Dog Kennel might just be a good option for you. 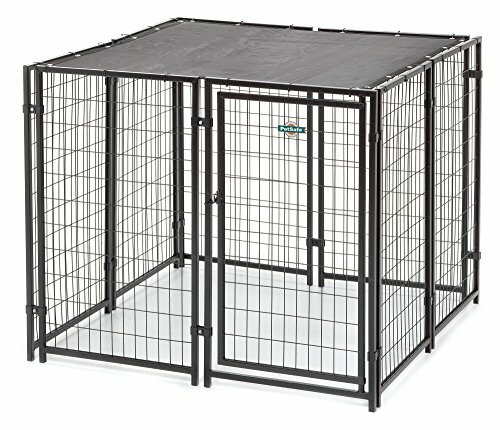 The kennel comes with a package that includes seven panels and an additional one for the gate. All these are made of sturdy commercial-grade steel metal for durability. The panels are finished using an all-weather and rust resistant powder coat in a classic black shade. These panels measure 5′ x 5′ x 4,’ and the design allows you to attach them using the clamps provided in the package. The Cottageview dog kennel comes with easy to follow instructions for fast assembly. You will need ½ inch wrench and wire cutters to secure the pet house safely. First, identify where you want to place the gate panel. You can choose to let it open on the right or left. Once the first panel is set, fix the clamps on the supporting panel to secure the next into place. Repeat the procedure for all panels using two clamps for each until all are upright and firm. You need to make sure you have a perfect square top to fit the protective cover in the right way. Using the cable ties, attach the sunblock top at the top rail corners of the kennel. Make sure the cover fits snug on top and use wire cutters to trim off the excess parts. You can purchase extension panels to configure the kennel as you wish. On average, it would take you approximately 30 minutes to an hour to set up. With extra assistance, you can assemble in less time. As mentioned, the kennel panels are made of high-quality metal steel. These ensure a firm construction of the kennel and give it the perfect weight to withstand outdoor conditions. The mesh design on the panels is sturdy enough to hold in place for an extended period. For small and medium dog breeds, the kennel can hold up well for a long time without the need to repair or replace any parts. This 5x5x4 dog kennel comes with a sun proof protective cover. It is made of a quality weatherproof material to protect your dog from rain and extreme sunlight. The panels are strong enough to withstand intense winds. Therefore, the kennel can be used in areas prone to strong winds. However, you should not note that the bottom part of the shelter is nor protected against flowing water. You ought to consider using it on a raised surface especially during the rainy season. One reviewer mentioned that the PetSafe Cottageview Boxed Kennel is super strong and that it held on well with their hyperactive puppy. They recommended it for playful dogs. Another appreciated the material quality and recommended it for the easy assembly in less time. Another said the kennel was not suitable for their adult Lab dog. However, with more reinforcement on the panels, it stood up well. Not suitable for large dogs, best for small to medium-size pets BUT expansion panels are available to accommodate larger dogs. Is the PetSafe Cottageview Dog Kennel a sound investment? The PetSafe Cottage View Dog Kennel is evidently sturdy for outdoors and indoors. One significant advantage is there is an option of using extension panels to come up with your design. It is designed to withstand extreme weather elements and keeps your pet safe and protected. With the gate latch provided, you can be sure your pet remains in there. I used the Petsafe outdoor dog kennel for many years with a lab/dobie mix and a Dachshund. They worked at giving my pups enough room and freedom to roam around when I wasn’t around. Both my dogs had a soft personality so they never tried to chew through the fence and we din’t live in a high-volume traffic area so wasn’t concerned about security. I did however have to carry out some maintenance to join together small sections every now and then from general wear and tear. But both had high-drive hunting instincts so this kennel worked very well and kept my dogs happily contained. Dogs are my life and they are the inspiration behind my blogging. I've owned dogs pretty much all my life and am truly enthusiastic about sharing everything I've learned from them to help you care for your own 4-legged pal! I'm the proud owner of a rescued Great Dane called Bertie. Nothing makes him happier than when we pack up our stuff and take off into the woods.